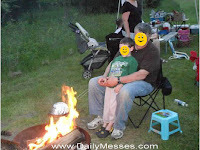 Daily Messes: The Great American Backyard Campout is Coming Soon! 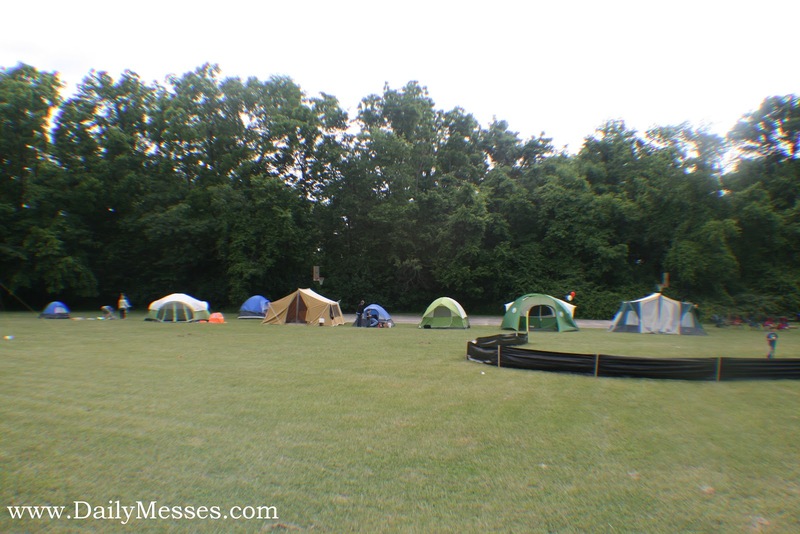 The Great American Backyard Campout is Coming Soon! One word--S'mores. 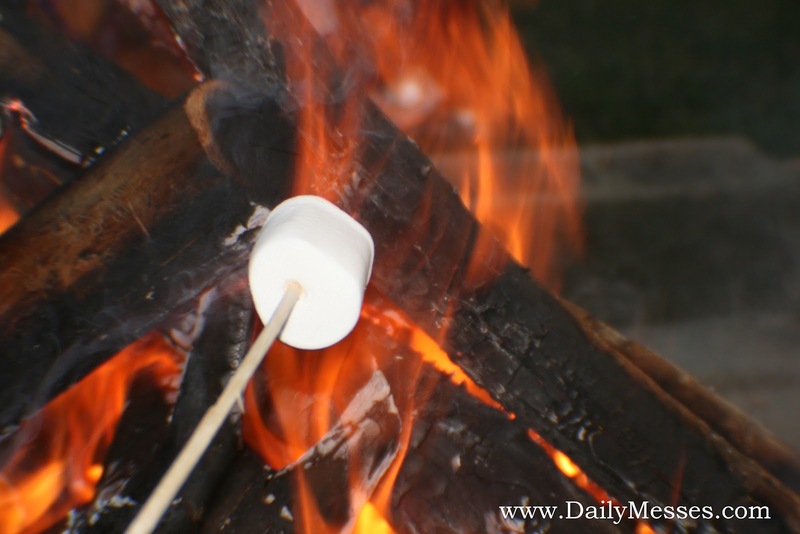 The combination of a roasted marshmallow with a piece of chocolate, sandwiched between two graham crackers is camping food perfection! We usually use sticks to roast our s'mores. However, sticks and small children aren't always a good combination. There are s'more holders so you don't have to use sharp pointed objects. I haven't tried them, but some of my friends have had success with them. Roast hot dogs. Hot dogs roasted over an open fire just taste better. Plus, there's less clean up! Star gazing, complete with a star map. Cloud Watching (if it's still daylight out when you start). Listen to the noises and try to identify wild animals. Bubbles. 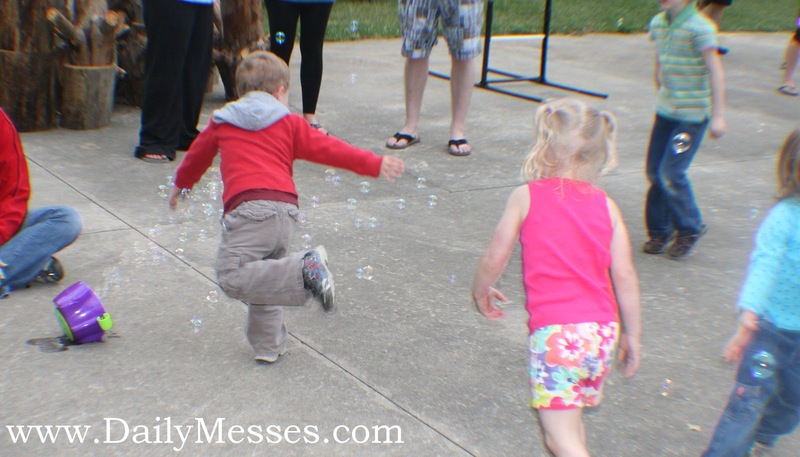 I haven't met a kid yet who doesn't like bubbles. Make and hang a pinecone bird feeder. Pop some popcorn. You can buy a stovetop popper (such as Jiffy Pop) and hold above the flames. You don't want to sit the metal pan on the flames, or you will burn the popcorn! There is also an extension handle you can use for camping so you are not touching the metal handle. I haven't tried it yet, but it looks neat. If you have a Spongebob fan, sing the Campfire Song, or another group type of song. If you don't have a yard, large patio or balcony, you can always camp indoors! Attach glow in the dark stars to the walls or ceiling. Since I know you probably don't want to have them there forever (I certainly don't), attach the stickers to paper or leave on the wrapper and cut out the shape. Then attach them to the wall or ceiling with Glue Dots. Have flashlights ready for when the sun sets. We usually have one per person, plus a chandelier inside the tent. Kids LOVE flashlights, so you might want to have a few extra batteries around. Mine like to use them as pretend light sabers and do sword fights. If you've never gone camping before, try easing the kids into it with reading. My kids love Curious George Goes Camping. For older kids, try Camp Out! Glow Bracelets! These are great for kids who need a little light in the dark, plus you can keep track of them running around the backyard! My kids love getting these on special occasions like camping. Use a tent. For me at least, I find sleeping in a tent more comforting than just a sleeping bag on the ground. (I know it's just a thin piece of fabric, but it makes me feel more secure. Plus it helps if it suddenly rains.) I really want to get this tent next! It has swinging doors, which make it easier for the kids to go in and out of during the day, and vaulted ceilings so the adults can actually stand up straight! If you have a bad back, or are not used to sleeping on the ground, get a cot! Make sure you read the specs on the cot to make sure you get the right sized one for you. Ryobi offers a free standing fan that runs on their rechargeable batteries. The batteries can charge via their wall chargers or they also sell a car charger. You can get the fan on Amazon or Home Depot. Home Depot also sells the vehicle charger for the Ryobi batteries. We've used the Ryobi fan for the last several years and it's been great! Coleman sells a free standing fan (runs on 4 D batteries). Coleman also sells a tent fan that hangs from the ceiling of the tent. Bug spray! I am not a fan of Deet, so I use natural based bug sprays. I've had good luck with Repel Lemon Eucalyptus Insect Repellent and Burt's Bees Herbal Insect Repellent. The Off Clip-On Fan works pretty well too, but if you're hiking or walking around it may fall off. There are also bug repellent buttons and bracelets.